"The brightest stars burn but for a short time." Wyatt Lane was only 6 months old when he passed away just before Christmas in 2012, but in his short time his ever-present smile touched the hearts of all who knew him. Born in May, Wyatt spent his first three weeks at the Janeway Children’s Hospital in St. John’s, Newfoundland before returning to his family in Port aux Basques. In November, Wyatt, their "Little Star", returned to the Janeway where he was diagnosed with an extremely rare heart condition. Under the attentive care of the Janeway team, he fought bravely, never losing his signature smile, for 33 days. 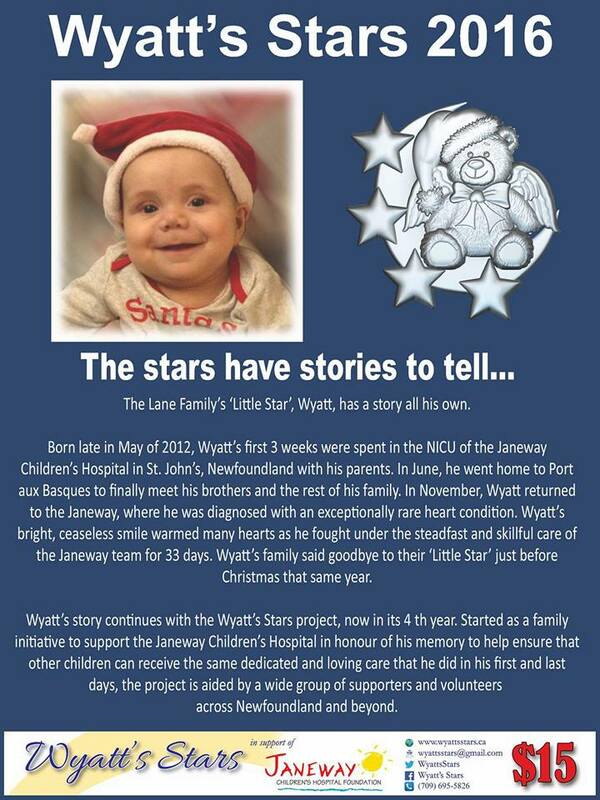 The Wyatt’s Stars project is an initiative of his family to provide support to the Janeway Children’s Hospital to honor his memory and help ensure that other children can receive the same dedicated and loving care that he did in both his first and last days. Teddy Bears - A source of comfort for children, Teddy Bears are also closely associated with the Janeway Children's Hospital. Angel Wings - For our Angel children who could not stay with us longer, they also honour the medical angels - doctors, nurses and medical teams - who work tirelessly and with so much compassion to care for our sick children. Stars - Wyatt was always our "Little Star", and stars represent hope and guidance, both for medical teams and families when children are sick. Also a symbol associated with Christmas, our "Little Star" passed away just a week before Christmas in 2012. Now in it's fourth year, the Wyatt's Stars project continues to raise much needed funds for the Janeway Children's Hospital, and purchasing an ornament is a beautiful way to honour the memory of this precious little boy who was taken too quickly. Losing a child has to be the most difficult, the most devastating and life shattering thing a person can ever endure, and I hope that Wyatt's parents - Yvonne and Jimmy can find strength in the outpouring of support that has come from their community and all across our province. Having the opportunity to love a child, even for a short time, is a gift and a blessing, and Wyatt was loved fiercely. Visit http://www.wyattsstars.ca for more info. Click HERE to download an order form, or visit their Facebook page HERE.